You can play Dungeons & Dragons and Pathfinder battles on a sketch, playing on a colorful, printed map raises your game’s visual appeal. Many of the artists who draw maps for adventures sell downloadable images of those maps. But these computer graphics never come scaled so that they print with a 1-inch grid sized for miniatures. Even when you solve the scaling, the images can’t fit on a single page from your printer. This post gives procedures for scaling graphic map files so they appear with a 1-inch grid, and then printing the map tiled onto multiple pages. You must have the free programs GIMP and PosteRazor installed on your PC. GIMP provides an image editor similar to Adobe Photoshop. 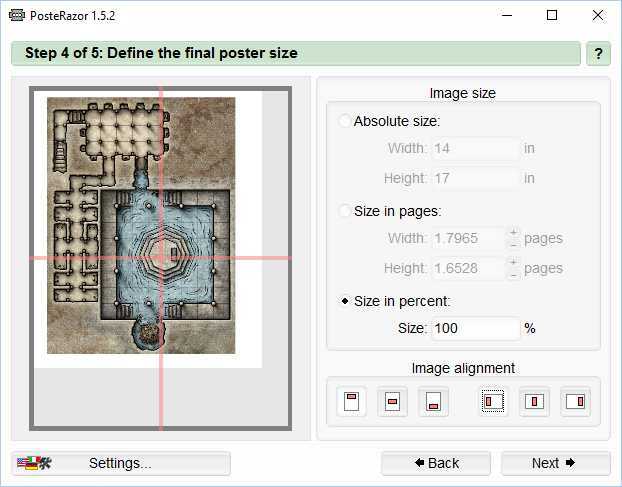 PosteRazor splits graphic files too big for a single page into multiple, printable pages, which you can assemble into a poster-sized map. 1 Click File > Open. 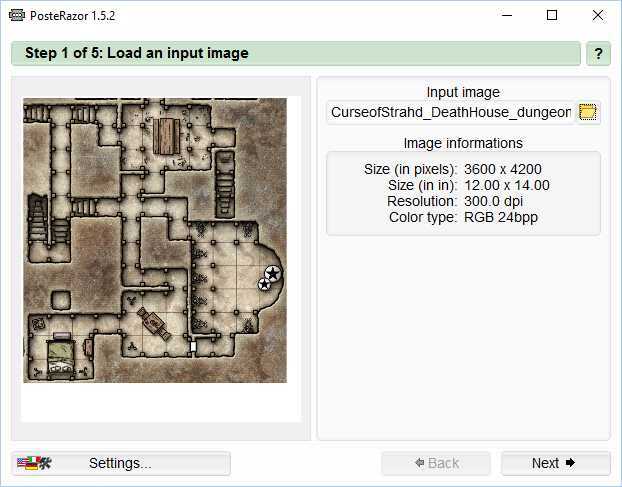 2 In the Open Image dialog box, select the graphic file that will become the backdrop for your battle map, and then click Open. Battle maps in Dungeons & Dragons and Pathfinder feature a grid of 1-inch squares. To print your map image so each square spans 1-inch, adjust its scale so the image’s dots-per-inch matches its number of dots-per-square. Start by measuring how many dots now span a square on your map. Note: If your map image lacks a grid, I’ll explain how to add one in Adding a grid to a map image. For now, this procedure refers to 5-foot plots on your map as squares, even if the lines don’t appear yet. 1 Find two landmarks or marks on the map where you know the distance separating them. the map includes visible grid Pick two parallel grid lines far apart on the map. Count the squares separating the lines. the map includes a scale Pick the ends of the scale. Read the distance from the scale. the map lacks a measure of scale Look for features that can establish a scale. Example: If the map includes 10-foot wide halls, the distance between walls can serve as a scale. the map lacks any measurable features Estimate a distance between two landmarks that suits play. 2 Click Tools > Measure. 3 Measure the shortest line between your landmarks. Click one landmark, press and hold the right mouse button, and then drag to the second landmark. As you drag, the angle of your line appears at the bottom of the window. When you measure a vertical or horizontal separation, drag a 0° or 90° line. Result: The distance in pixels appears at the bottom of the window. 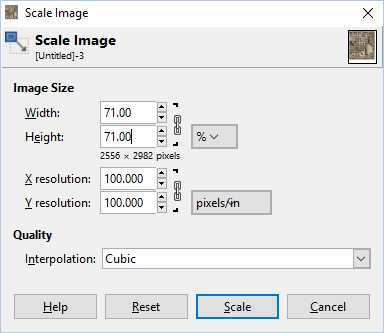 4 Calculate the width of a square in pixels. you found a distance in squares Divide the measurement in pixels by the number of squares. The result is the width of each square in pixels. Example: If you measured 330 pixels between grid lines 6 squares apart, then each square is 55 pixels wide. you found a distance in feet Divide the measurement in pixels by the number of feet. Multiply this result by 5 to get the width of each square in pixels. Once you know the number of dots per square on your map image, scale the image so its dots-per-inch and matches its dots-per-square. 1 Divide 10000 by the number of dots per square. Result: This gives the percent scaling needed to make each square 100 pixels wide. 2 Click Image > Scale Image. Set the scaling drop-down menu to %. For Width, enter the percentage calculated in step 1. Height will change to match. Set the X resolution value to 100 pixels/in. Y resolution will change to match. Result: The image scales so each square becomes 100 pixels wide. Most graphics suitable for battle maps include border areas that you don’t need to print. Remove these unnecessary areas by cropping. 1 Click Tools > Transform Tools > Crop. 2 Point the cursor to the upper-right corner of part of the image you want in your map, press and hold the right mouse button, drag the pointer to the lower-left corner of your map, and then release the mouse button. Result: A rectangle highlights the part of the image that will remain after the crop. 3 If you want to adjust the size of the rectangle, point inside its corners or edges, press and hold the right mouse button, and then drag the edge or corner to its new size. 4 Double click the rectangle. Result: GIMP trims the image to the rectangle. If your image already includes a grid, skip the next procedure for adding a grid. If your map image lacks a grid, you can add one. 1 If you want your grid to align with a vertical feature such as a wall, measure the distance from left edge of the graphic to the wall. Click on the left edge of the graphic, press and hold the right mouse button, and then drag to wall. As you drag, the angle of your line appears at the bottom of the window. Drag a 90° line. Result: The distance in pixels from the top of the graphic to the wall appears at the bottom of the window. 2 Calculate the vertical offset by noting just the 10s digit and the 1s digit measured in step 1. Example: If you measured 123 pixels between the edge of the graphic and a vertical wall, then the vertical offset is 23 pixels. 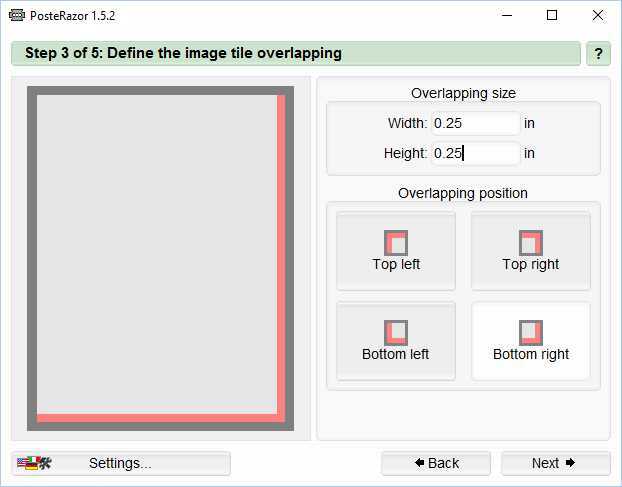 3 If you want your grid to align with a horizontal feature, repeat steps 1 and 2 to calculate a horizontal offset, but now measure a 0° line from the top of the graphic to the feature. 4 Click Filters > Render > Pattern > Grid. Enter a Width of 3 px. Enter a horizontal and vertical Spacing of 100 px. If you calculated an offset in steps 1 to 3, click the chain links under the Offset setting, and then enter the calculated offsets. If the map features dark colors and a white or gold grid would be more visible, click the first color box and select a lighter color. Result: A grid appears over the map image. 1 Click File > Export As. 2 Select JPEG image from the drop-down menu. 3 Enter a file name that ends with the .jpg extension. Most battle maps won’t fit a single sheet of paper. To print a larger map, you must split it into tiles that can print on separate pages. 1 Open a map image by clicking the open folder icon beside the Input image field, selecting the image file, and then clicking Open. Select a paper format from the drop-down menu. North America typically uses Letter format, while the rest of the world typically uses DIN A4. Enter 0.3 for all the borders. 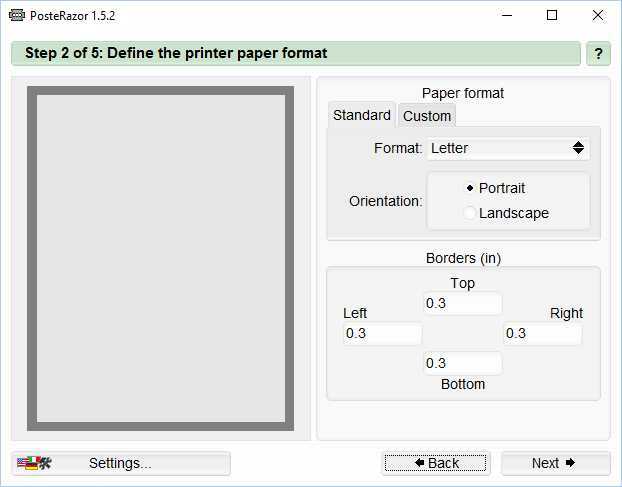 This values limits the map to the printable area of most printers. Setting overlaps of 0 saves paper, but forces you to trim pages exactly to avoid white space or missing map. The lack of overlap at the seams between pages makes your map easier to fold. Setting overlaps of 0.25 lets you make imperfect cuts when you trim the pages, because you can align a cut with the overlapping edge of the next page. 4 Set a Size in percent of 100, and then click Next. Hint: Posterazor shows a preview of the graphic with the overlap areas marked in red. Count the number of pages shown in the preview image, and then back up to step 2. Switch the page orientation to Landscape, and then advance back through the procedure. Use whichever page orientation uses the fewest pages. 5 Click the disk icon under Save the Poster, and then select a filename and location for a PDF version of the map. Result: Posterazor saves a multi-page PDF version of your map that you can print. 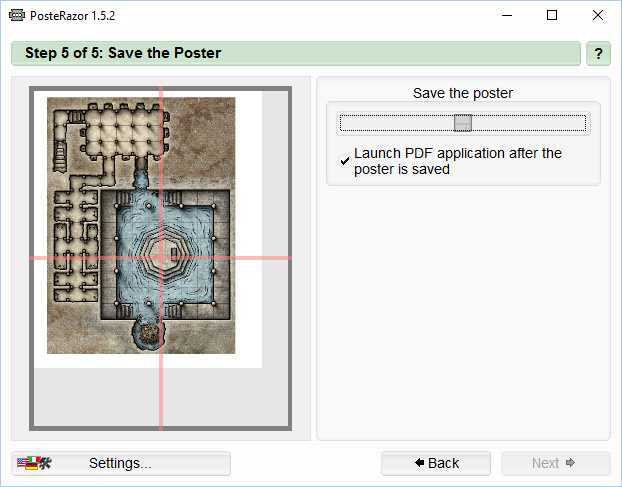 6 Print the map from your PC’s PDF viewer. 7 Cut the 0.3-inch unprinted edges from your pages and tape them together into a map. Mike Schley sells his map graphics for many of the current Dungeons & Dragons adventures. Jarod Blando sells his maps for Out of the Abyss. NewbieDM explains how to scale maps using PhotoShop. 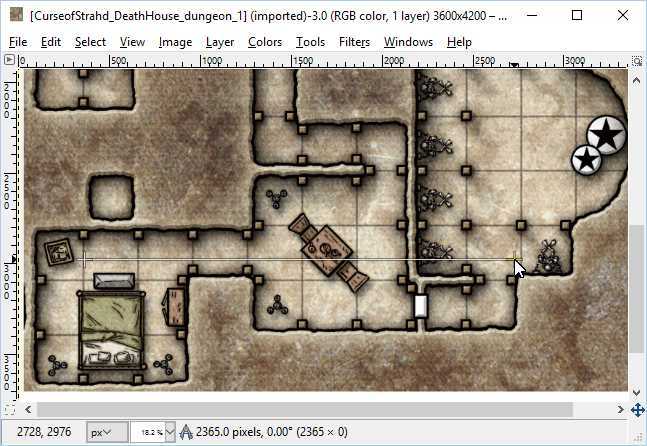 This entry was posted in Dungeon master's tools and tagged battle maps, GIMP, Posterazor. Bookmark the permalink. A fantastic article! Thanks so much for the step by step how to. Rarely do I comment on blog posts, but having just discovered your blog two days ago when searching for miniature-storage tips and then seeing this article, I had to write and say thank you for your excellent and informative posts. I really hope you compile these into a book because already in a couple articles that I read, your blog has helped me more than any published book on being a better DM has. Thanks for the high praise! I’ve thought about compiling my DM advice, but for I still plan to write about many topics that would belong in that compilation. Then compile them in a single page format. Ideally we could print them out double sided, 3 hole punch them and put them into our black DM’s binder. If you do this in the same organizational paradigm of the old Star Fleet Battles with a DMDecimal system of rules organization you could be to DMs what E.G.G. is to RPGs in general. Just saying i’d buy two of those! thanks for the very useful article. really good work. Besides, previously I was printing map thx to poster printer. It was looking very cool. Don’t remember exactly but probably was really easy to use. I was able to workaround the problem by editing the map, scaling, etc in GIMP and then printing with MSPAINT. Just wanted to thank you for this post. For myself, with a background in digital prepress, print production, and consulting in those things over the years, the pointer to the Grid plug-in was great info. My personal thanks. On behalf of others the topic of “battlemaps” has come up in other forums over the last two weeks supporting two different games (D&D and Traveller) and I have been happy to share the link to this. On their behalf, thank you. The response has been very positive. For myself I have not found Posterazor that useful. Some of that may be my experience with things like PhotoShop over the years: I can manage building my own tiles without needing Posterazor to do the divisions for me. I’m not clear from your procedure quite how you’re handling the grid lines. Anymore I tend to favor using Layers in GIMP and rendering the GRID as its own layer which I move to the top of the layer stack or make visible as the last step before exporting to JPG or direct printing. Layers have many additional uses of course. Learning how to “Open as Layer” makes using other photos as templates very handy. The volume of public domain architectural, archaeological, and other images and drawings is delightful and a ready source for “raw material” and sometimes more refined material. A 19th Century drawing of the plan of a Roman arena, touched up and modified as necessary quickly becomes something very usable for instance. 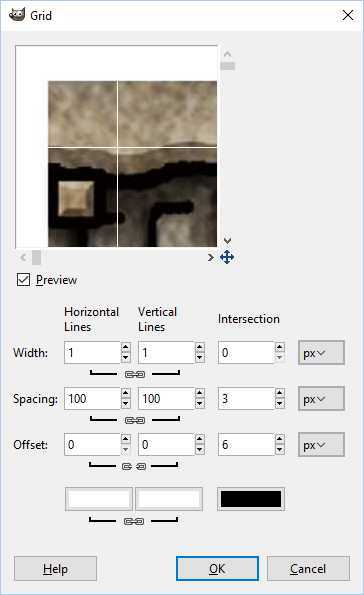 More complex and specific battle maps can be build up from smaller “tiles” either for virtual tabletops or print outs. I tend to save a few common bases: flagstone floor, grass, leafy forest floor. Once I have those, dropping in walls, putting a table there, a chest there, click print. Done. It’s also very easy to do things like lay out the interior and immediate surroundings of a cottage and put the roof as a separate layer. Print with and without the roof layer visible and it’s a simple matter to lay down what the characters see as they approach and “lift the roof” should they enter. Layers also allows some other refinements of a similar nature. I may work a detailed battlemap with the major elements on separate layers: base, structure, furniture, roof. Printing them separately or in appropriate groups creates tiles and props. The tables in the inn are no longer bolted down and better accommodate the occasional “bar fight” for instance. A little exploration of GIMP can lead to amazing power.